I'm republishing them here on my blog and inviting readers to make their own recommendations for podcasts I must try - you point, I'll review. This particular review featured on January 23 - and I'll be adding others over the coming days. 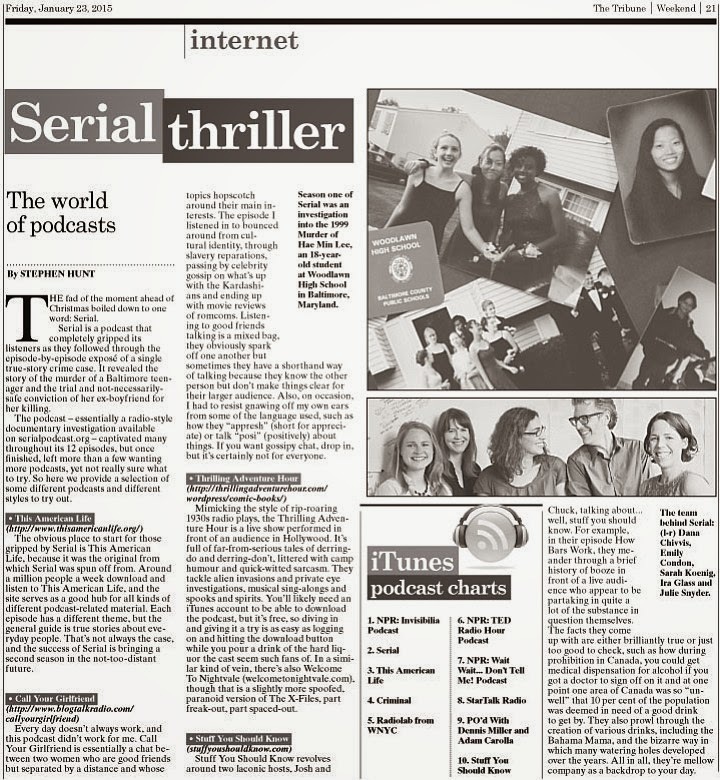 THE fad of the moment ahead of Christmas boiled down to one word: Serial. Serial is a podcast that completely gripped its listeners as they followed through the episode-by-episode expose of a single true-story crime case. It revealed the story of the murder of a Baltimore teenager and the trial and not-necessarily-safe conviction of her ex-boyfriend for her killing. The podcast – essentially a radio-style documentary investigation available on serialpodcast.org – captivated many throughout its 12 episodes, but once finished, left more than a few wanting more podcasts yet not really sure what to try. So here we provide a selection of some different podcasts and different styles to try out. The obvious place to start for those gripped by Serial is This American Life – because this is the site that Serial span out from. Around a million people a week download and listen to This American Life, and the site serves as a good hub for all kinds of different podcast-related material. Each episode has a different theme, but the general guide is true stories about everyday people. That's not always the case, and the success of Serial is bringing a second season in the not-too-distant future. Everyday doesn't always work, and this podcast didn't work for me. Call Your Girlfriend is essentially a chat between two women who are good friends but separated by a distance and whose topics hopscotch around their main interests. The episode I listened in to bounced around from cultural identity, through slavery reparations, passing by celebrity gossip on what's up with the Kardashians and ending up with movie reviews of romcoms. Listening to good friends talking is a mixed bag, they obviously spark off one another but sometimes they have a shorthand way of talking because they know the other person but don't make things clear for their larger audience. Also, on occasion, I had to resist gnawing off my own ears from some of the language used, such as how they “appresh” (short for appreciate) or talk “posi” (positively) about things. If you want gossipy chat, drop in, but it's certainly not for everyone. Mimicking the style of rip-roaring 1930s radio plays, the Thrilling Adventure Hour is a live show performed in front of an audience in Hollywood. It's full of far-from-serious tales of derring-do and derring-don't, littered with camp humour and quick-witted sarcasm. They tackle alien invasions and private eye investigations, musical singalongs and spooks and spirits. You'll likely need an iTunes account to be able to download the podcast, but it's free so diving in and giving it a try is as easy as logging on and hitting the download button while you pour a drink of the hard liquor the cast seem such fans of. In a similar kind of vein, there's also Welcome To Nightvale (welcometonightvale.com), though that is a slightly more spoofed, paranoid version of The X-Files, part freak-out, part spaced-out. Stuff You Should Know revolves around two laconic hosts, Josh and Chuck, talking about... well, stuff you should know. For example, in their episode How Bars Work, they meander through a brief history of booze in front of a live audience who appear to be partaking in quite a lot of the substance in question themselves. The facts they come up with are either brilliantly true or just too good to check, such as how during prohibition in Canada, you could get medical dispensation for alcohol if you got a doctor to sign off on it and at one point one area of Canada was so “unwell” that 10% of the population was deemed in need of a good drink to get by. They also prowl through the creation of various drinks, including the Bahama Mama, and the bizarre way in which many watering holes developed over the years. All in all, they're mellow company as a backdrop to your day.